The property is situated in the hills close to San Gimignano facing south-east and offers a beautiful panoramic view. Due to the height of 400 - 500 m above sea level the area is ideal to produce white wines of excellence. 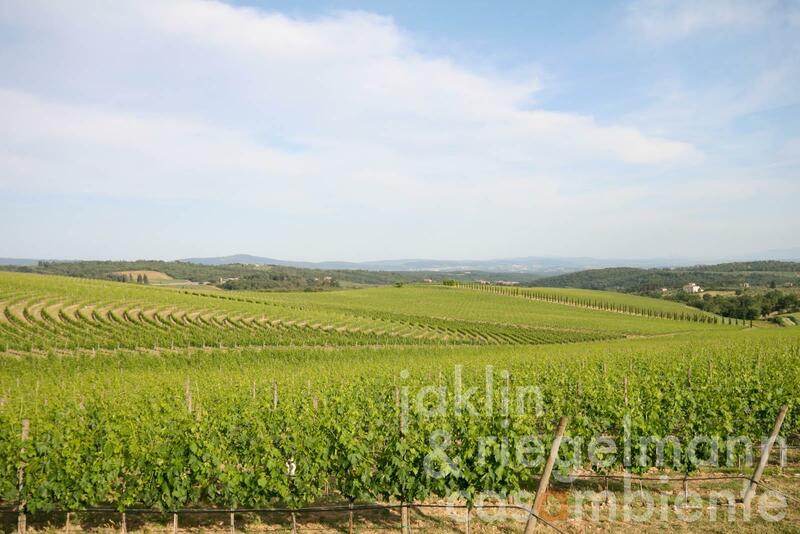 The farmland is 209 ha (516 acres), of which are 33 ha (81 acres) vineyards as follows: 23 ha (57 acres) Chardonnay DOC; 5 ha (12 acres) Vernaccia di San Gimignano DOCG; 5 ha (12 acres) Pinot Grigio DOC. With 5 ha olive groves and 164 ha woodland. The grapes are sold to well known and famous wine producers, i.e. the farm currently does not produce its own wines. There is the possibility to develop the farm buildings building a cantina and to create own labels. Part of the property is an area of 3.5 ha with the historical ruins of an ancient castle dating back to the 11th century, the same period when the nowadays famous San Gimignano historically was mentioned the first time. The buildings are grouped in 4 units: Fattoria with Villa Padronale; 2 Farms; 1 Farmhouse; towers and walls of an ancient monument. The villa padronale actually is lived in by farm workers, but does not offer a modern living standard. All buildings are awaiting restoration. 209 ha (516 acres), of which are 33 ha (81 acres) vineyards, divided in 23 ha (57 acres) Chardonnay DOC, 5 ha (12 acres) Vernaccia di San Gimignano DOCG, 5 ha (12 acres) Pinot Grigio DOC, 5 ha olive grove, as well as 164 ha woodland. Electricity, mains water, own well water, central heating, fireplace, garage, carport, private parking, terrace, vineyard, garden.